If there’s a milkshake that will make you travel all the way to Rajajinagar in North Bangalore, it’s Sagar Hotel’s iconic mango milkshake. It’s liquid gold! 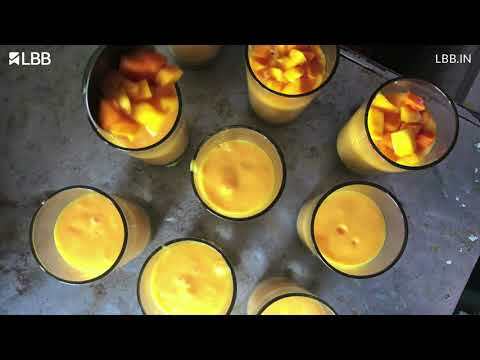 Fresh mango slices and cold milk are all you need to make a mango milkshake. But then what makes Sagar Hotel’s Special Mango Milkshake so different, so special and so worth the hype? It could be to do with the fact that they use fresh slices of Alphonso mango. Yup, fresh slices of mangoes are blended with milk and sugar to a rich and thick concoction that when poured into a glass looks like liquid gold. It’s that and a bit more as those who know of this iconic milkshake will tell you. That topping of cut mangoes cubes and fresh cream are what make this milkshake truly special. Don’t even bother asking for a straw. Just use the spoon to mix the cream and mangoes into the milkshake and then use it to scoop up all of that goodness. Repeat the process until there’s only the milkshake left to drink. Bottoms up or take your time because you are likely to order another round. If you are going in during the evenings, you will see glasses and glasses of this milkshake being ordered, so you will probably have to wait a bit to get your order. Probably order their dabelis and vada pav (both legendary) while you are waiting for your first (or second round).